With 2016 is coming to an end, I thought that it was important to review the highest grossing film in Japan this year ($172 million) and the second highest grossing anime film of all time ($288 million). The film has received critical acclaim, earning 97% on Rotten Tomatoes and a 81 out of 100 on Metacritic. 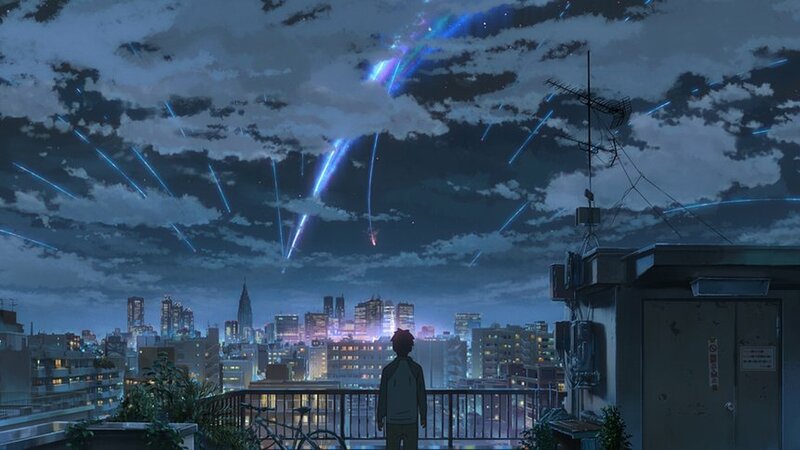 Your Name is from the director Makoto Shinkai, who created Distant Star and 5 Centimeters Per Second. It’s based on the novel of the same name, it premiered during the Anime Expo 2016 convention on July 3, 2016. 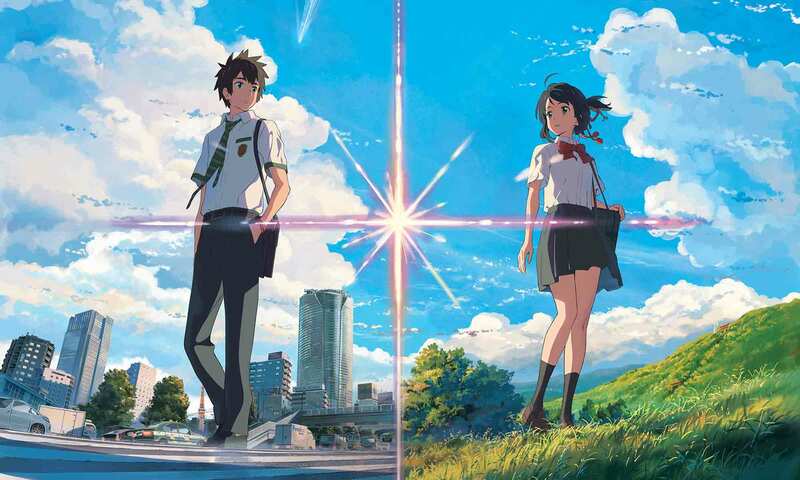 Your Name was animated by CoMix Wave Films and distributed by Toho. The story centers on a high school girl named Mitsuha who wishes to be a handsome Tokyo boy in another life. A boy named Taki, wakes up and realizes that he is now Mitsuha. Taki and Mitsuha switch bodies, they communicate through leaving paper notes and memos in their phones. They begin to interfere in each others lives, Mitsuha helps Taki being a relationship with a coworker, Miki Okudera. Taki increases Mitsuha’s popularity in high school. Suddenly, Taki and Mitsuha return to their previous bodies. Taki begins searching for Mitsuha, without having the name of her village, he uses sketches that he created by memory. He is finally told by a restaurant server that he’s looking for Itomori. However, he is informed that a fragment of comet Taimat fell to earth three years ago, killing a third of Itomori population. Taki searches through the names of fatalities and sees Mitsuha name listed. He realizes that Mitsuha existed on the completely different timeline. Taki drinks an offering that Mitsuha leaves behind and returns to her body. He attempts to save the town, managing to convince her friends to help her evacuate the town. Eventually, they finally meet, Taki tells Mitsuha to convince her father to evacuate the town. Their memories of each other begin to fade and Mitsuha begins to give up on Taki. However, after inspiration from Taki’s “I love you,” she begs her father to evacuate the town a second time. The comet crashes into Itomori, it is revealed eight years later that Mitsuha succeeded in convincing her father to evacuate the town. Taki has moved on, living his life, he graduates from university. However, he does have a fondness for items from Itomori. Finally, while riding on parallel trains they see each other and finally ask each other their names. I generally don’t gravitate towards anime outside of the typical Shonen type, however, the critically acclaim of this movies made me curious. I’ll admit that I really liked this movie. I cared about Taki and Mitsuha, their relationship and was sad when I found out she had initially died. Even with it’s heartbreak, Your Name does have some humor. The tendency of Taki to fondle Mitsuha’s breast’s when inhabiting her body, while juvenile, was still funny. Finally, the animation is some of the best you will ever see. Even if your not a fan of romance (like me), any anime fan will enjoy this movie. Check it out. Happy New Year. I want to watch this movie so bad!!! Omg thank you!!!!!!! I’ll watch it subtitles I don’t even care lol.